A few years ago, a friend of mine asked help looking for her grandfather. Her grandfather apparently had dementia and accidentally got out of the house when no one was looking. For those who don’t know, dementia refers to the decline in mental ability severe enough to interfere with daily life. Memory loss is an example. Due to this, my friend’s grandfather was lost for about a week! However, thanks to social media and flyers posted around the metro, some people were able to recognize him and bring him back home. Ever since this happened, I’ve learned to look at the elderly in a different light. I can’t help but think, “What if this man has dementia? What if his family is worried sick for him right now?”Just a few days ago, a photo of a seemingly lost Italian National started spreading over Facebook. His family was all the way in Italy and he had no idea what his name was. It reminded me of my friend’s lost grandfather. 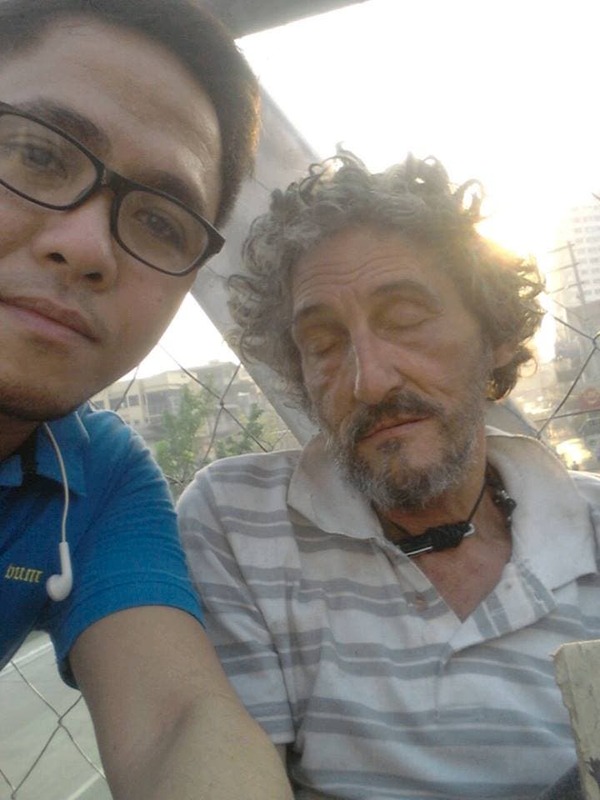 Rjay Avelino Seraznaer spotted an Italian national on the streets of Makati. Being a concerned citizen wanting to help out, Rjay took a photo of the Italian in hopes that it may reach his family. This may be a long shot but let’s try to help find this guy’s family. Last May 8 at around 6am, I went to get my N.B.I. along U.N. Avenue. I was along Buendia, on my way to work in Bel-Air, Makati. I had to take the overpass in order to get to the other side of the street where the jeepneys were waiting. That’s where I spotted this guy. I asked him where he came from and he told me he was from Italy. He also said that his whole family was there. I told him I’d upload his photo on Facebook in hopes that his family might see it. I’m not sure why, but he didn’t want me to do so. The only reason I was able to get his photo was because I asked him instead for a souvenir. He also didn’t know his name. I was in a rush and was only able to give him some money. Let’s all try to help him and through God’s mercy he will be reunited with his family. Poor guy. At the moment, we have no further update on the Italian national. However, through everyone’s help, we hope to be able to get to the bottom of this and help this man reunite with his family. If you have any additional information you would like to share, please feel free to leave a comment or send us a private message through our FB page.